eSpecially Ben: Magic Marker Monday: Hands Down to the Bunny! By painting the pointer and pinky fingers and palm of the hand, this bunny comes alive. 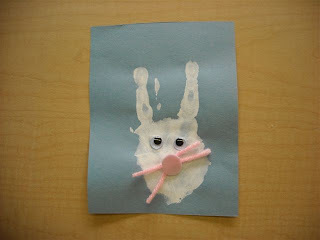 Add googly eyes and a nose made from pipe cleaners and felt and you have a cute card to give out to grandparents and friends. Need some art inspiration for your household? Check out 5 Minutes for Special Needs every Monday. And if you have a little artist in your home, link up and share with others.